You see, somehow I had gotten the idea in my head that it was past time for the Little Guy to do away with his comfort item (binky) at night time (mean Mommy) and just rely on his blue stuffed “ABC doggie” to provide the tag for him to stroke soothingly between his fingers. I’m not sure why this need hit me so suddenly (kind of like when I suddenly realize I need a haircut and then can think of little else but to get it scheduled!). So the poor Little Guy who was just recovering from an awful bout of croup last weekend (requiring a doctor visit for steroids on Saturday….then a doctor visit for antibiotics for the ear infection on Monday morning….and then tortured by a doctor visit for flu shot Monday evening….and now “no like doctor”…) is suddenly faced by a mother who thinks it’s time to prepare for college and wean off any childlike things (we’ll work on the diapers next). Surprisingly, he seemed to cope just fine without the binky at night. He would lay beside me while I read to Super Tall Guy and then play happily on his bed until he fell asleep. It all seemed to be going well (at night) but I soon noted a terribly disagreeable pattern in the mornings. I’d hear Little Guy rustle around at 4:15….then call my name repetitively at 4:34….then come to my room at 4:49….then stand at the foot of my bed at 5:15….then climb into my bed at 5:22…. And any time I would snap “get back to bed” or guide him back to his room and bed, a torrential of tears would ensue surrounding the words “Mommy, mommy, mommy.” While seemingly heartbreaking for him, it would also prove to be quite disruptive to the sleep habits of Super Tall Guy flipping around in my bed and Mr. Ornery sleeping on the floor of the “boys’ room.” I believe I’ve mentioned before that I become an irrational beast when awoken before 6 am. And then, this morning at 5:08, it dawned on me! I took Little Guy back to his bed and said “wait here…and I’ll get your binky.” Magic words. He waited. He stayed in his bed. 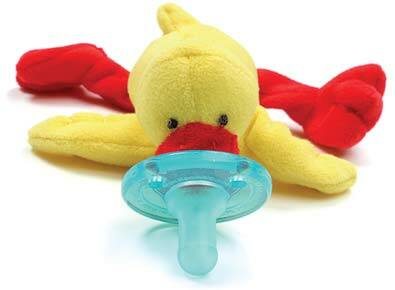 He reached up eagerly for the monkey and ducky Wubbanub and fingered the tabs at the tail end and drifted back to sleep. I eagerly returned to some unanswered dreams until 6:30 when he rejoined me….and we lay in bed until 7. Wow. That was worth caving in! I think this caving falls into the parenting rubric of “pick your battles.” And this is not only trying to choose which battles are important to your kid….but which ones maintain any semblance of your own personal sanity. For example, the boys do eat in my car (which is now growing the next generation of penicillin to help solve the problem of antibiotic resistance). In addition, I have given in to the fact that chicken nuggets can be a protein source, and that ketchup is a daily antioxidant and natural vegetable (though we all know tomatoes are fruits). And, I have given up the saying of “no jumping on the couch” – instead it has become “no jumping on other people’s couches! !” And, I also cave a bit more than I’d like in using a very large flat screen as a “distractant” while accomplishing other miscellaneous tasks around the house. Yes…..my parenting has changed from what I might have imagined it would be. And yet, it is working (sometimes) for the needs of myself and my boys – and surviving the day (and finding glimpses of joy) is what counts!! Guess what’s in the Little Guy’s mouth tonight? This entry was posted in Single parent and tagged binky, caved in, giving up, pick your battles, sleep, Wubbanub by middleofthemadness. Bookmark the permalink.